Visit to Kathmandu by Dr Gillian Holdsworth, co Chair of BNMT. Inauguration of community toilets at two tented camps in Bhaktapur and a visit to a health camp at Sipaghat in SindhuPulchowk – where over 400 patients were treated. We were sad to hear of the death of Dr Penny Cunningham on 9th July 2015 following a long illness. In April 1968 eleven young men and women set out from England in three landrovers to drive to Nepal, 7,000 miles away in the Himalayas. All were members of the first medical team of the newly formed Britain Nepal Medical Trust, the brainchild of John and Penny Cunningham who wanted to give back to a part of the world where medical skills were most needed some of the privilege of their own upbringing. What a tremendous legacy they left. It has been six weeks since the devastating earthquake which hit the country in April and there have been over 100 aftershocks since. The tremors are coming everyday. Today there was a tremor, yesterday there was a tremor – for the locals the earthquake has not stopped. Heavy rains in the last week have brought additional distress with a number of districts reporting significant mudslides with additional loss of life. BNMT continues to focus our earthquake relief on trauma counseling, sanitation, medical supplies and distribution and relief for affected areas in the form of shelter and supplies. We are supporting affected communities with trauma counseling and now training other organisations with the skills necessary to provide similar programmes of care – so extending the access to these services. With the advent of monsoon – access to safe water and sanitation facilities amongst displaced communities remains a high priority – especially in and around Kathmandu valley with its high population density. We are working through the District Public Health Offices in a number of areas with the building of community latrines. Some of this work has been specifically supported by Handle with Care International – Thank you! We have been supported very generously by International Health Partners (IHP) with medical supplies – which we have been distributing through the District Public Health offices in affected districts as well as running primary care clinics in some of the remoter areas. Thank you IHP! Finally – a big thank you to the Britain Nepal Society. Since the earthquake they have been actively fundraising to support the earthquake relief of two charities – BNMT and the Gurkha Welfare Trust. They held a fundraising event at the Nepal Embassy in London on Friday 12th. His Royal Highness The Duke of Gloucester attended the event and Isabella Tree spoke about The Living Goddess – the stories of the Kumaris of Kathmandu valley. And our co-Chair and her friends are walking 100km on 17th/18th July in support of the BNMT Earthquake appeal – follow their fundraising progress and donate here. There was a further big earthquake in Nepal, the epicentre was 50 km North East of Kathmandu on 12th May. People are again sleeping outside in tents or under plastic. The fear of many people is palpable and there is a real need for psychosocial counseling. This will be one of BNMT’s major focus areas in the rehabilitation process over the coming weeks. Another focus will be to promote sanitation and hygiene especially in highly populated areas around Kathmandu valley where the risk of diarrhoeal diseases is high, especially with the monsoon season coming soon. BNMT will be working with local communities to build gender friendly latrines in affected areas and partnering with Handle with Care International, who have kindly funded some of these latrine blocks. We are grateful to all of you for the tremendous support we have received over the last few weeks. The response of our friends and supporters has been truly amazing. A powerful earthquake hit Nepal. The quake measured 7.9 on the Richter scale and has been followed by several aftershocks. The epicentre was North West of Kathmandu and there has been extensive damage in the capital. BNMT are supporting the rescue effort – please give generously. Over 7,000 people have died, thousands are injured, homeless and struggling to find basics like clean water and need urgent help. There is a high risk of waterborne diseases spreading through the population. 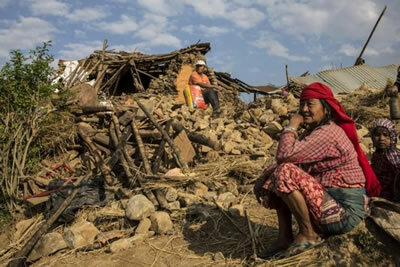 In the mountainous areas north west of Kathmandu 80% of dwellings have been destroyed. BNMT is supporting the relief effort focus on reaching the unreached populations around Kathmandu valley and in remote mountain areas currently not accessed by the international effort through our extensive networks across 45 districts in the country. The immediate need is the provision of first aid, temporary housing, food and clean water. All donations will go directly to support the earthquake relief. We have teams conducting public health assessments in communities in and around the Kathmandu valley providing primary care medical support and supplies, shelter, clean water and sanitation. Many people are severely traumatised by their experience and BNMT are supporting communities with trauma counselling. Outbreaks of diarrhoea and infectious diseases are a real risk in the valley at the moment, which is heavily populated and hosting many displaced people. We are working with the Nepal Nurses Association UK who have sent a team to work with us in the districts of Gorkha and Lamjung (the epicentre of the quake) and provided medical supplies to the Government for Dolakha and Ramechap. The relief, rehabilitation and reconstruction programme is enormous and will take many years. We are fundraising in the UK and internationally to support the relief effort. All donations to BNMT will go directly to earthquake relief for affected communities. 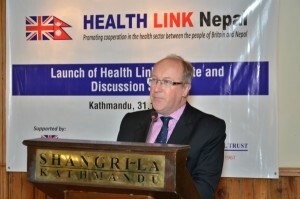 The Health Link initiative has been launched to mark the close links between the UK and Nepal in the development of Nepal’s health sector and the forthcoming anniversary of 200 years of UK-Nepal diplomatic relations. Since the 1950s, UK based agencies and the UK government have played a major role in developing Nepal’s health services while many UK health professionals have gained invaluable experience working on programmes in Nepal. The first element of Health Link is a “Discussion Forum” which aims to engage and promote debate on key health issues in Nepal. Both international and national experts will promote discussion on health issues, health research and health care developmental efforts in Nepal. The Health Link website at www.healthlinknepal.org has information about organisations working on health in Nepal and publications on health in Nepal that have a UK connection. There are also links to Government of Nepal organisations and publications. In addition it provides information for UK students who wish to become interns or volunteers or carry out research in Nepal. the site also serves as a platform for interns and volunteers to share their experiences of working in Nepal. The e-discussion part of the website provides a platform for health professionals, researchers and other interested people to discuss topical issues to do with health in Nepal. Simon started his love for Nepal as a medical student on his elective with BNMT. His strong affiliation for this beautiful Himalayan country and its people saw his return as field doctor for BNMT in 1980. The days when recently qualified and idealistic Western doctors still roamed the Eastern Hills and were responsible for running the TB and leprosy control programmes in remote district centres. Simon’s commitment and closeness to the Nepali people no doubt helped to establish the respect BNMT enjoys to this day in Nepal. The extremely isolated existence suited his striking individuality. Despite being the only Westerner in Bhojpur, he stayed for 3 years, establishing strong relationships with the Nepali staff with whom he worked and the local population. His memory lived on long after he had gone in many stories and in the dhara (water supply) he donated on leaving Bhojpur. 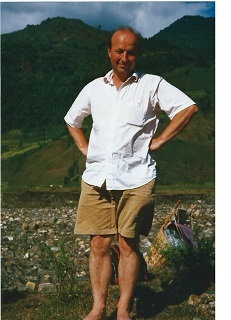 After returning to the UK he maintained his links with Nepal and BNMT eventually becoming a trustee; a role he fulfilled for 23 years. His intelligence and wit were always a vital ingredient of the trustee meetings, when not restricted in later years by his tendency for an afternoon snooze! Initially uncertain which path his medical career should take after BNMT he finally decided on psychiatry. A foray into medical anthropology displayed his significant academic abilities and his original mind. He produced a fascinating PhD thesis (published as a book “Making Doctors”) after embedding himself in a London medical school to try and objectively observe the influences at work in producing British doctors. His insights were revealing; although medical education has changed somewhat since then this would still be useful reading for all medical students. Whilst still in Oxford he met and married his beloved MA and they started a family. They eventually moved up to Durham as he pursued his career in psychiatry combining clinical and academic responsibilities. As well as his demanding job he was always dedicated to his family and often spent weekends ferrying his children to their commitments, in particular as distinguished choristers. Happily, he continued to travel South to the Trust meetings until very recently when he retired as a trustee after the diagnosis of his prostatic cancer. The course of his illness was traumatic but he faced it with the courage and realism one would have somehow expected from this unique personality. He will be sorely missed.